Collins, UK, hardcover, 1936. Dodd Mead, US, hardcover, 1936. Many reprint editions, both hardcover and soft, including: Collins, UK, hc, 1980 [Crime Club 50th Anniversary edition] and Grosset, US, n.d (both shown). Crofts was a transportation engineer and worked for railway companies for many years before retiring in 1929 to become a full-time writer. A number of his novels make use of his technical knowledge of railroading and shipping, such as Death of a Train (1947), in which Inspector French investigates a World War II plot to divert vital supplies being shipped to the British forces in North Africa. 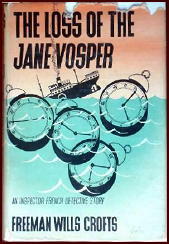 Similarly, The Loss of the “Jane Vosper” draws on Crofts’s knowledge of the shipping industry. This book — and most of Crofts’ others — presents no real challenge to the reader in terms of outwitting the detective and solving the case first. If anything, we feel that we are being taken by the hand and led on a genteel journey through the routine of a careful and dedicated investigator. 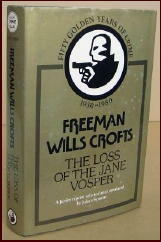 Other Crofts novels dealing with the shipping industry include Mystery in the English Channel (1931), Crime on the Solent (1934), Man Overboard (1936), and Enemy Unseen (1945). Books in which Crofts drew on his railroading background include Sir John Magill’s Last Journey (1930), Wilful and Premeditated (1934), and Dark Journey (1954). 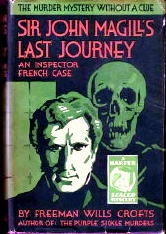 A short-story collection featuring Inspector French, Many a Slip, was published in 1955.